Life looks better through the lens of gratitude. You’re probably already aware of the many benefits—mental, physical, emotional, and spiritual—of gratitude. In order to reap these benefits, you need to find a way to remind yourself to remain thankful throughout the day. That is, keep gratitude at the forefront of your awareness. The best way I’ve found to do this is to establish a gratitude practice. A gratitude practice consists of simple exercises that encourage you to integrate thankfulness into your daily life. The key is to choose exercises that work for you, and to mix and match them in order to keep things fresh and inspiring. To that end, below you’ll find 8 exercises to help you practice gratitude. 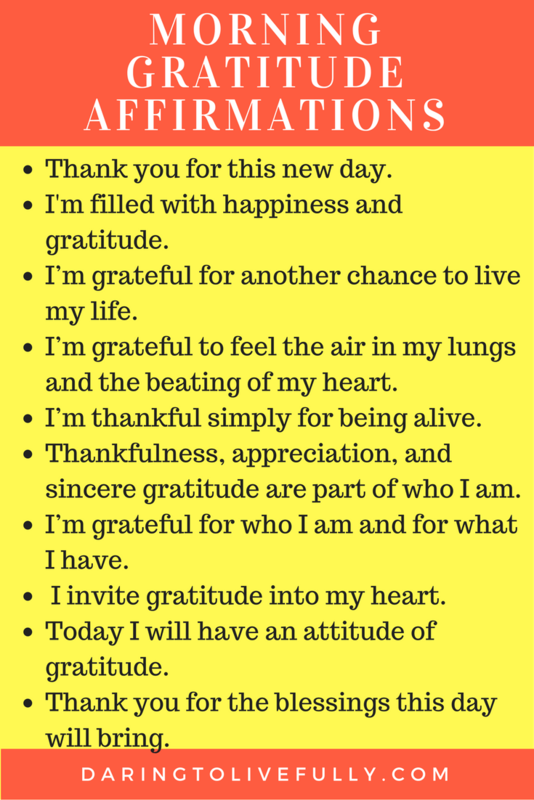 Start your day on the right foot with morning gratitude affirmations. Affirmations of gratitude will help you to set the intention to spend your day in a state of thankfulness. This will allow you to notice the good that surrounds you and to better cope with any unpleasant surprises which the day may bring. I printed the image above, I had it laminated, and I have it pinned up where I drink my morning coffee so I’ll be sure to see it every morning. You’re welcome to do the same, if you wish. 2. Create a Gratitude Collage. A place you traveled to recently which you loved. Your favorite part of the house. Cook your favorite meal and then photograph it. Have someone take a picture of you while you carry out your favorite activity. 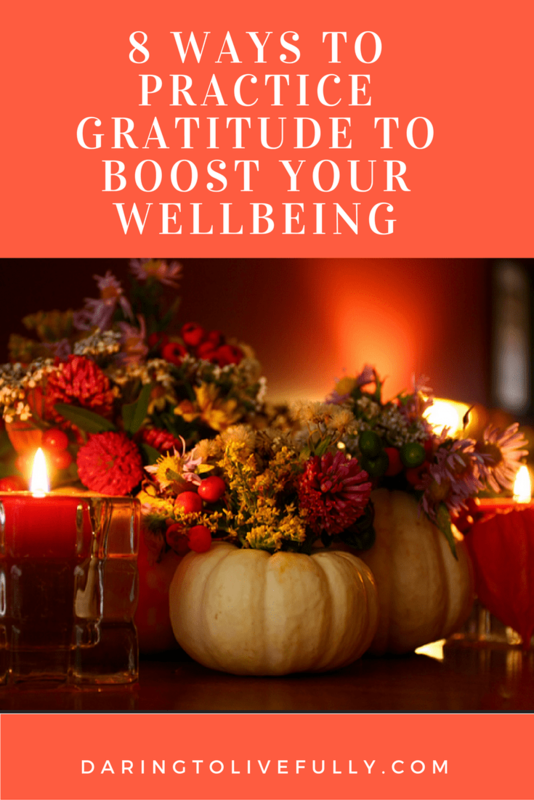 You can create an online gratitude collage by using Canva, PowerPoint, or Fotor. Then, use it as your desktop background. That way, whenever you turn on your computer you’ll be reminded of everything that you have to be grateful for. Many years ago I read Alexandre Dumas’ “The Count of Monte Cristo”, and the following quote stood out for me: “It’s necessary to have wished for death in order to know how good it is to live.” What that quote said to me was that, in order to truly appreciate the good, you need to contrast it with the bad. As an example, right now I’m sitting at my desk in my home office, typing away on my computer. However, last week I was having trouble with my internet connection. In addition, on Friday my laptop’s screen suddenly started getting fuzzy, and then it just died. Therefore, I spent the weekend without a computer. All I had was a tablet, and a faulty internet connection. Needless to say, it was pretty stressful. However, on Monday I bought a second-hand monitor for my laptop, and my internet provider fixed the connectivity issue that I was having. What a relief! Now, if I want to feel instantly grateful, all I have to do is compare what I have at this moment, to the situation I was in over the weekend. That contrast immediately shifts my focus to how good things are at this precise moment. Remember a time when you were wet and cold. Remember a time when you felt sick or were in pain. Remember a time when you were scared. To feel truly grateful, remember the bad. 4. Designate a “Gratitude Spot” In Your Home. Get all of your family members involved in your quest to be more grateful. You can do this by choosing a spot in your home and designate it as the “gratitude spot”. 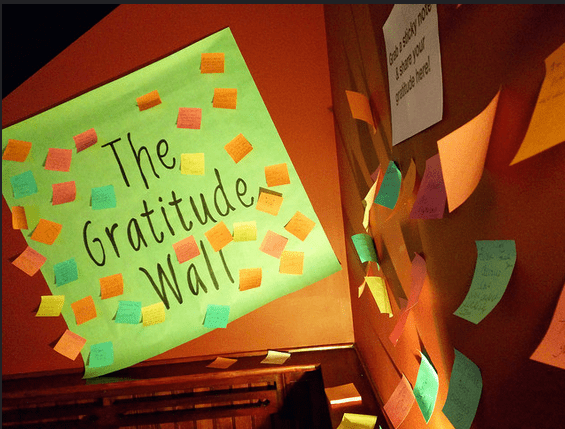 The gratitude spot is a place where everyone is encouraged to record what they’re grateful for. Have your refrigerator be the gratitude spot–get some pieces of scrap paper and use small magnets to put them up on the fridge. Make sure that there’s easy access to a pen. Tell your family members to write down anything that they’re grateful for on the pieces of paper when they walk past the fridge. Put up a bulletin board, a whiteboard, or a blackboard in a central place of your home so that any family member can jot down their “thank yous”. Get a jar, designate it as the gratitude jar, and place it on a side table in the family room. Set up scraps of paper and a pen next to the jar. (Here’s a cute one you can copy). Your loved ones can write down what they’re grateful for on the scraps of paper and then fold them, and place them in the jar. Walk around on cold days without a coat. Skip meals and allow themselves to get really hungry. They would do this because denying yourself makes you appreciate more fully the things that you take for granted. I practice self-denial in order to make things more special. For example, I love tamales. Tamales are available all-year-round in Panama. However, I only allow myself to eat tamales in December and on the first day of January. That is, they’re a holiday treat for me. On the first of December, or as soon as I can find the time once it’s December, I buy tamales (I’ve identified the place that makes the best tamales in Panama). Then, I light my Christmas tree, I sit in front of it, and I eat a tamale. I cannot explain to you how good it tastes and what a joyful experience it is. And that’s because I deny myself tamales during the other eleven months of the year. We tend to think that gratitude is triggered when more riches come into our lives, but it can also be sparked by setting limits and by temporarily denying ourselves so that we can truly appreciate the good that we’re already surrounded by. 6. Carry a Gratitude Stone. A gratitude stone is a rock or pebble that you carry with you–you can place it in your pocket or in your purse–as a reminder to practice gratitude. Think of it as a gratitude anchor. Whenever you happen to touch it throughout the day, give thanks for something right at that moment. You can get stones with the word “gratitude” engraved on them, or simply find a smooth stone when you go out for a walk. 7. The ABCs of Gratitude. Whenever you find yourself with some downtime—for example, when you’re waiting at the dentist’s office, standing in line, or stuck in traffic—go through the ABC’s of gratitude. That is, for each letter of the alphabet, come up with something that you’re thankful for. A – Amazon. I couldn’t find Shakespeare’s “King Lear” or “A Midsummer’s Night Dream” in English anywhere in Panama. However, I’m going to have them soon, because I ordered them from Amazon. Thank you, Amazon! B – Books. I know this is related to the point above, but reading is one of my favorite things to do. (I read Bram Stoker’s “Dracula” during the month of October.) Plus, I love being surrounded by books. C – Ceci. Ceci is one of the cashiers at the fruit store which is two blocks away from my building. I walk there every day to buy fresh fruits and vegetables, and she always greets me with enthusiasm and has a kind word to say. D – Dogs. Just looking at a dog makes me happy. Today as I was walking back from the fruit store I came across a gorgeous, incredibly friendly husky. When I started petting him he immediately lay on his side so he could better enjoy the experience. That put a big smile on my face. 8. Take a 21-Day Gratitude Challenge. A short while ago I wrote about happines habits that will tranform your life if you carry them out for 21 days. Two of those habits involve gratitude. Check out the post and increase your happiness, while becoming more grateful, in just 21 days. I hope that at least a couple of the gratitude exercises explained above resonated with you. If so, use them in order to practice gratitude. Live your best life by being more grateful.